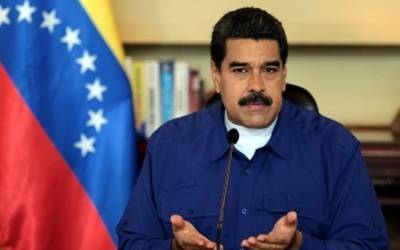 Caracas, Feb 9 (IANS) Venezuelan President Nicolas Maduro slammed the European Union (EU)-backed International Contact Group on Venezuela, but said he would be prepared to meet its representatives, while self-proclaimed interim head of state Juan Guaido said his supporters were ready to create a humanitarian corridor if the incumbent blocks international aid. "I’m ready and willing to receive any envoy from the contact group," Maduro told a press conference on Friday at the presidential palace, though he rejected the "partisan, ideological" lens through which its members view the oil-rich nation, reports Efe news. The contact group, which seeks a solution to Venezuela’s political and economic crisis through dialogue and new presidential elections, includes Germany, the UK, Spain and France, and a handful of Latin American countries such as Uruguay, Ecuador and Costa Rica. Mexico participated at the group’s inaugural meeting on Thursday in Montevideo, but did not sign a statement calling for new presidential elections in Venezuela. Leftist-led Bolivia also refused to support snap presidential elections in Venezuela. The US, Canada, numerous Latin American countries and the major European powers all consider Maduro’s May 2018 re-election victory to be tainted by fraud and have recognised Guaido, the speaker of the opposition-controlled National Assembly, as Interim President. Guaido, speaking on Friday at the Central University of Venezuela in Caracas, said that if Maduro continues to prevent the entry of a shipment of humanitarian aid from the neighbouring Colombia, the opposition would mobilise to create a corridor so the assistance could reach Venezuelans in need. Venezuelan armed forces officers and troops have the opportunity to participate in a humanitarian campaign that would help alleviate severe problems in their country, which is suffering from widespread shortages of food and medicine and hyperinflation, Kevin Whitaker said in the Colombian border city of Cucuta. Maduro has thus far used the military to block the aid from entering Venezuela, denying that the country is suffering a humanitarian crisis and saying the delivery of the shipments would be a prelude to a US-led military intervention. US President Donald Trump has imposed severe sanctions on Venezuela’s oil industry and was the first recognise Guaido as Interim President within hours of his January 23 proclamation. Trump said last month that "all options are on the table" in dealing with Maduro. Mexican President Andres Manuel Lopez Obrador reiterated on Friday that the only path to a solution of the crisis in Venezuela is dialogue between the government and opposition. Lopez Obrador, as he has done throughout the current crisis, referred again to the foreign policy principles set out in Mexico’s constitution: non-intervention, self-determination of peoples, peaceful settlement of disputes and respect for human rights.